12-March-2019: Bid Opening 11am at the CIESC offices. 31-July-2019: Please get your specifications started. 18-September-2019: Bid Opening 11am at the CIESC offices. 31-January-2020: Please get your specifications started. Take the work out of bus buying. Use our unusually simple process for this complex task to save time and money. 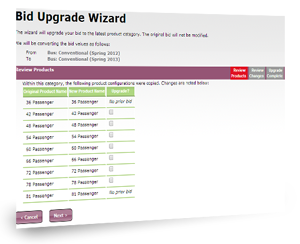 Re-use previous years' bids, and our wizard directs you to any changes. Fully compliant with state government board of accounts audit requirements. Cooperative Bus Purchasing With cooperation from school bus vendors, the CIESC designed a web based bus purchasing program in which all Indiana school districts can take advantage of group purchasing, regardless of the size of their order. A district ordering one bus gets the same price as a district ordering 20 buses. This program will save you time when ordering new buses. Simplify ordering All the information you need - vendors, specifications, bids, and contacts - is available in one convenient package. Bus that fits your needs All school bus manufacturers and bus styles are available. Accuracy in ordering Every order is reviewed to make sure you're getting what you want at the right price, and your order is discussed with you if there are any questions. Save money Ordering in quantity always saves money, even when it comes to buses. When many schools order through one program, vendors can offer better prices.